No matter your level of camping experience, every camper needs a great tent to sleep in at night. If you are looking for a new tent, perhaps you should consider a teepee. A teepee is a less commonly used tent shape. Teepees are traditionally Native American, but today many companies have modernized the teepee tent design for you to enjoy. Teepee tents are a great option for a camping tent if you are looking to change up your style. Teepees have a triangle top and rounded bottom, which means you can easily fit a group of people inside and have the luxury of some head space. Experience nature with our list of the 10 Best Teepee Tents in 2018! If you are looking for space but want to save on weight, this Teepee Tent 12’ x 12’ by Winterial is an excellent choice for a lightweight but still roomy design. You will have plenty of room to stand up and stretch while still sleeping up to 7 adults inside this top rated teepee tent for camping. This tent also features an easy set up. Don’t be fooled by its large size, Winterial tested and made sure that their tent could still be set up in a quick 5 minutes. As well, this tent is made of 210T polyester fabric, which ensures that this teepee tent can withstand the elements and keep you dry. 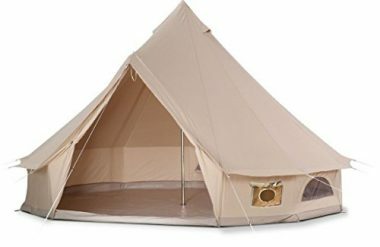 Embrace the outdoors with this spacious teepee tent and even take along a few furry friends on your adventure. If you liked the previously listed teepee tent but the size held you back, don’t’ worry because Guide Gear offers a smaller version as well. The Teepee Tent 10’ x 10’ by Guide Gear brings all the benefits of a lightweight polyurethane material into an even more compact design. If you are looking for a more intimate space, this teepee gives you the feel of being cozy while still providing enough space to move around and stand up. 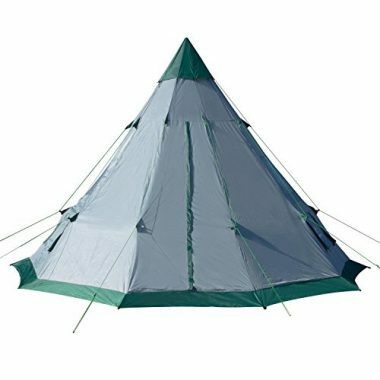 Like Guide Gear’s larger version, this teepee is made of 190-denier polyester with a 1,000mm polyurethane waterproof coating. You won’t need a ground cloth because the polyurethane goes to the floor and is sewn in. There is added privacy through window shades and factory sealed seams, but you won’t have to worry about losing airflow. There are top and bottom vents to always keep fresh air flowing through your teepee. 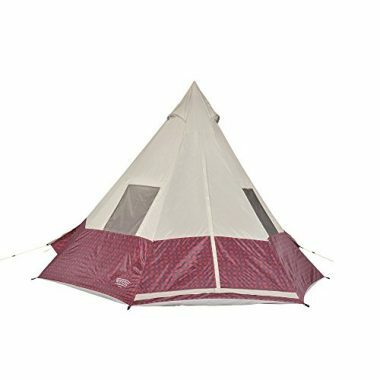 Relax with this breathable and cozy teepee tent by Guide Gear. 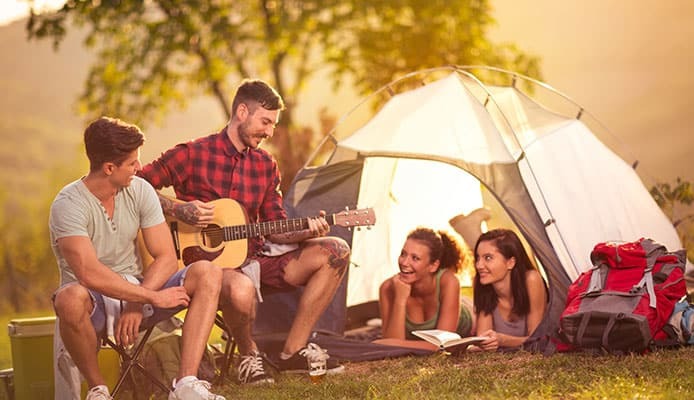 If you want to upgrade your camping to glamping and bring along your large group of friends, this teepee tent can easily fit everyone in your party. This Luxury Outdoor Glamping Tent by Dream House comes in a variety of sizes to fit as little or as many friends that you want. The variety of sizes allows you to fit entire beds inside. The 16.4-foot diameter version of this tent can easily fit one king sized bed and two twin sized beds. If that is too large, there is a smaller diameter available that can still fit one queen sized bed and two twin sized beds inside. The tent is made of cotton canvas and has been coated with a 3000mm waterproof PU coating. Cotton is a material that shrinks when it is wet and makes itself waterproof as it rains. This means that leakage may occur during the first use with rain, but once it is fully dry it will have sealed all the holes to be entirely waterproof. The tent also features a heavy-duty zipper and double stitched seams for reinforcement. As well, there are mosquito screens for the doors and windows to keep you at bay from the biting bugs. The tent can also withstand up to 30 miles per hour of wind and included in the purchase, are the guylines and tent pegs for securely grounding your outdoor home. If you are looking for a tent that can be used all year long, this Four Season Cotton Bell Tent by Danchel Outdoor will have you beating the heat and resisting the cold weather. The teepee tent is made of canvas cotton fabric with a 3000mm waterproof treated surface. In the winter, you can easily add a stove and use the provided stove window to warm your cozy teepee tent. The door zips down securely and all windows can be closed from the inside. In the summer, the door and windows have a mosquito net that can be zipped closed. If you are looking to catch any wind that comes your way, this teepee tent has a unique 360-degree view feature. All teepee tent sides can be rolled up, which leaves only the top canopy. With the open sides you can sit back and relax, and the top canopy will ensure that you are still protected from the sun. You and your friends can take in the amazing view from the comfort of your teepee tent. 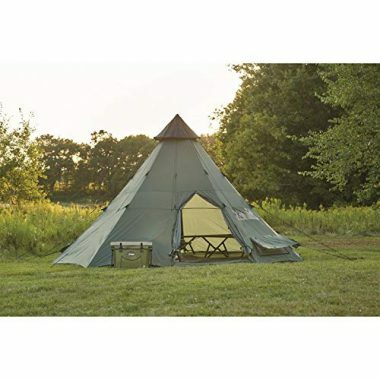 Canvas can be a heavy material and if you are looking for a teepee design that is more lightweight, this Teepee Tent 18’ x 18’ by Guide Gear is one of the top-rated teepee tents for camping. This design is 18 feet by 18 feet and sleeps 10-12 people. The teepee features a quick and easy set up. To set up this teepee, all you have to do is position the center pole and stake the guylines. The teepee is made of a lighter, but durable material. The shell is 190-denier polyester with a 1,000mm polyurethane waterproof coating. The floor is also made of polyurethane and is sewn in, which means you don’t have to worry about adding a ground cloth. You will have plenty of privacy with the internal shades on the windows and factory sealed seams. As well, you will still breathe easy when you sleep thanks to the multiple vents ventilation system. With vents in the peak of the teepee and the ground, air will flow freely through to keep you cool and smelling the clean air. You can be sure to have a memorable camping trip with this teepee tent. If you are looking for a teepee tent that is more durable, this Bighorn Teepee Camping Trail Tent by Tahoe Gear features a center pole for added stability. The teepee tent is made of 1000mm polyester, which gives you heavy duty protection with a fraction of the carrying weight. This teepee tent will keep you dry and grounded in winds up to 35 miles per hour. As well, humidity won’t build up and you can sleep feeling dry with the roof and side ventilation. The floor ventilation flaps can be opened and closed to fit your needs and there are four windows inside to allow you to take in your surrounding view. If you are looking for a twist on the traditional teepee tent design, this Deluxe Teepee Tent 14’ x 14’ by Guide Gear offers a covered entryway into your teepee tent. Unique to Guide Gear’s design, you can leave your boots and gear inside the entryway or make it a bedroom for a four-legged friend. The best part is that no matter what you place inside, it will still be 100% sealed and protected from the elements. This added entryway can also greatly help keep the sleeping chamber of your teepee tent clean. You won’t have to worry about tracking in dirt and mud, when you leave your shoes at the door. You will also have the privacy benefits of window shades and sealed zippers, which also help keep you dry. This teepee tent is made of 190-denier polyester with a 1,200mm polyurethane coating. The floor features the polyurethane material as well, so there’s no need for a ground cloth. There are multiple vents throughout the design, which ensures you won’t overheat inside. You can also quickly pop up this teepee tent and have it set up in a flash. Sleep comfortably in nature with one of the best teepee tents for camping. 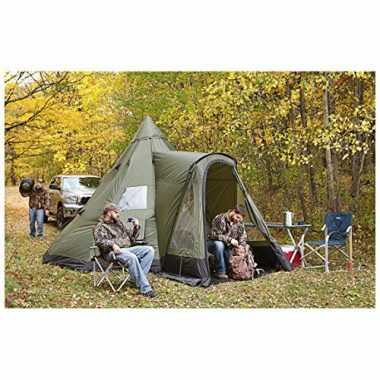 If you want the least obstructive design, this Teepee Tent 11’8” x 11’8” by Ozark Trail is the best teepee tent for you. With a two-pole system, this teepee tent features no center obstruction and gives you more space to move around. The two-pole system also means that this teepee tent is quick and easy to set up. You can easily fit up to 7 sleeping bags or a couple air mattresses inside because you will have 105 square feet of living space. As well, there are vents and windows to allow for decent airflow for you and your companions. With a 10-minute set up, you’ll be relaxing in your teepee tent before the rain can catch you off guard. This top rated teepee tent for camping is one of the best minimal designs you can take on a trip to the outdoors. 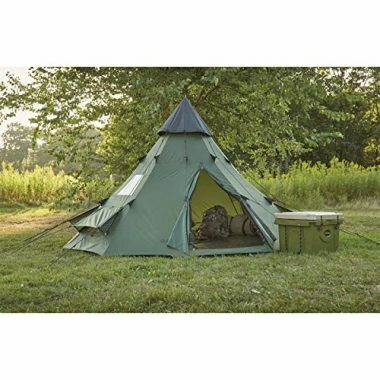 This teepee tent is made of polyester and will keep you safe from the elements. You can fit up to 5 people inside this spacious teepee tent. As well, the windows are fitted with screens and privacy shades, which ensures that you can let the fresh air in or keep the rain out. Wenzel offers two fun designs to choose from, so you can be the stylish leader of the pack and stand out with your teepee tent. If you are looking for a teepee tent that will last throughout the four seasons but has some unique features to use in the wintertime, this Four Season Cotton Canvas Tent by PlayDo is the right pick for you! This teepee tent is made of treated cotton fabric and can withstand wind and rain. 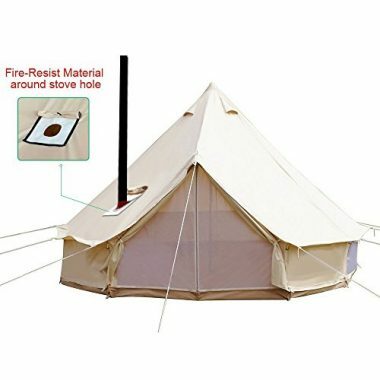 With features especially for winter time, such as the top stove tent pipe, this teepee tent will have you warm and cozy in the coldest of weather. In the top of the teepee tent’s design is a stove hole instead of having a stove opening in the side wall. This hole can be covered when it is not needed anymore, and it will ensure your teepee tent retains the heat. As well, you can feel secure with the safe and fire-resistant material around the stove hole. 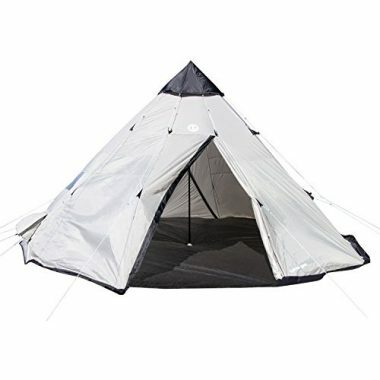 These specific features make this teepee tent an excellent choice for use in colder weather. The teepee tent is waterproof, but if you would like added protection you can purchase a top tarp separately to really beat the rain. With this teepee tent you will easily be having fun and relaxing with a large group as you make the great outdoors your temporary home. When it comes to choosing which teepee tent is best for you, it is important to consider a few key features. There are many different teepee tent designs, and some may better suit your needs. There are elements to each design that can enhance your experience in the great outdoors. From the size to the style, these elements of the teepee tent’s design can help you decide what you need. Down to the specific details, here is a guide to help you choose which teepee tent is best for you. The first design element you should take into consider is how many people you would like to sleep inside your tent. The size of the tent is important because it will dictate how many people you can bring on your trip, while still keeping all of your belongings safe and dry. Normally teepee tents are more spacious and offer plenty of head room to stand up and stretch. Beyond just how many people you are wanting to bring along, the size of the teepee tent can dictate which activity you will use it for. If you are car camping, a larger teepee tent won’t be a problem for you to transport and set up. However, if you are looking for a teepee tent for backpacking, size will be extremely important because you have to carry the tent with you. 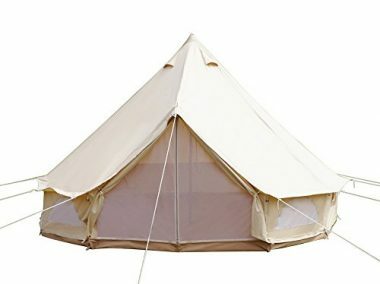 All teepee tents should list their dimensions and give a capacity limit. You can use the provided information to determine which sized teepee tent you need. As with any tent, learning how to set up your teepee tent can bring some challenges. If you are more accustomed to setting up a traditionally shaped and structured tent, a teepee tent may pose as a challenge for you because of their unique design and shape. If a teepee tent takes too long to set up, you may find yourself caught in a rainstorm, which could hinder your process. It would be a bummer to ruin your teepee tent or be stuck in the rain. A teepee tent that is too large may also be difficult to set up without the correct number of people. It is highly likely that a 12-person teepee tent will be extremely difficult to properly set up if you only bring along 4 people. It is important to look at the teepee tent instructions and be certain that you can set up the teepee tent correctly in a remote camping setting. One hint that may make the process easier is to take the time to learn how to set up your teepee tent in your backyard, before you hit the road. This can reduce stress and allow you to give the set up a few practice runs. As well, you can learn the fastest and most efficient set up process for your chosen teepee tent. Materials are an important aspect of the design because they will dictate the durability of your teepee tent. From the fabric that makes your teepee tent to your poles that support the structure, it is best to look for high-quality materials that will meet all the criteria of your camping adventure. Most materials that make up the fabric of the teepee tent are going to be waterproof or, at the very least, treated to be waterproof. This is important because you’ll want protection from the rain, even if you aren’t expecting a storm to roll through. The most common teepee tents are made of cotton canvas or polyester and polyurethane. The material can also dictate how heavy your teepee tent is. A cotton canvas material is going to be heavier than a polyester and polyurethane teepee tent. As well, the poles which support your teepee tent’s structure need to be strong and durable. The poles will hold up your teepee tent, as well as resist rain and wind. The best poles would be made of carbon fiber. This makes them strong and lightweight. However, carbon fiber can be pricier, and the next best option would be aluminum. Aluminum can give you the same durability as carbon fiber, but with a more affordable price point. Ventilation is important for a teepee tent because you will want to use it in hot summer conditions. Summer is a great time to enjoy the weather and relax in a teepee. The ventilation design of a teepee tent can save you from sleeping in sweat and keep you more comfortable in general. If you are in an already humid climate, a sealed teepee tent can raise the level of humidity even more once you are zipped inside its walls. The best teepee tents will have ventilation flaps or windows to allow for air to flow through. This will ensure that you are comfortable and can use your teepee tent in hot and humid heat. If you are camping close by or using your car, the weight of the teepee tent may not be as important to you. If you only take your teepee tent from the car to the campsite, chances are you’ll have no problem with a heavier material and design. 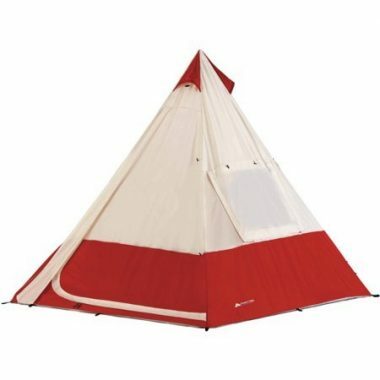 However, if you are looking to use a teepee tent for backpacking you will need to take into consideration the weight. When you are carrying an object on your back, the weight will make all the difference with maintaining your stamina. The lighter the teepee tent means the easier it will be for you to carry it along the trail. It is best to determine whether you want to backpack with a teepee tent and if you do, find the best lightweight teepee tent that is still durable enough for your adventure. For any outdoor teepee tent it is important that it is waterproof or, at the very least, can be made waterproof. Even if you think you won’t be using your teepee tent in wet conditions, think again. Nature can be unpredictable and it’s best to be prepared. The best teepee tents for camping will be waterproof without having to take any additional steps. Whether you are using a cotton canvas or polyester and polyurethane teepee tent, they will have waterproofing already included in the design. However, not all may come fully waterproof. Look at your teepee tent and determine if you need to take additional measures to keep the rain out. You may be able to easily make your tent waterproof by buying a tarp or spray separately. These additional accessories can benefit your teepee tent’s water resistance greatly and help you enjoy your teepee tent without the worry of a storm passing by. When purchasing a tarp, remember to ensure that it will fit your model of teepee tent. If you choose to purchase a spray, ensure that it will adhere to your teepee tent’s material and can be safely used. There are many different styles of teepee tents and it comes down to your personal preference in choosing which one you would like to use. 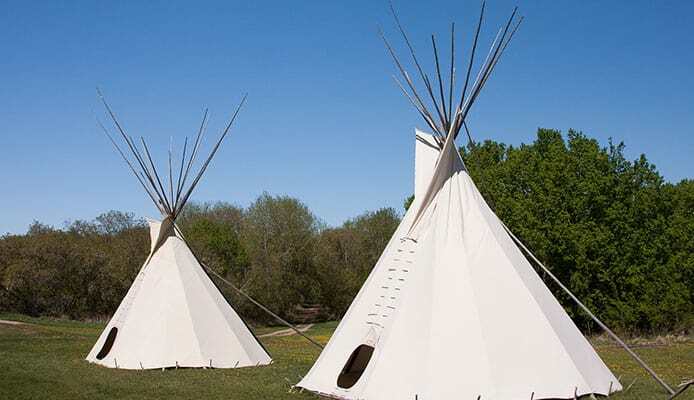 In general, most teepee tents are going to be pointed at the top and have a round base. That is what makes your tent a teepee. Some teepee tents may look more like a circus tent and others may resemble the more traditional design taken from Native Americans. As well, the material used can drastically affect the look of your teepee tent. 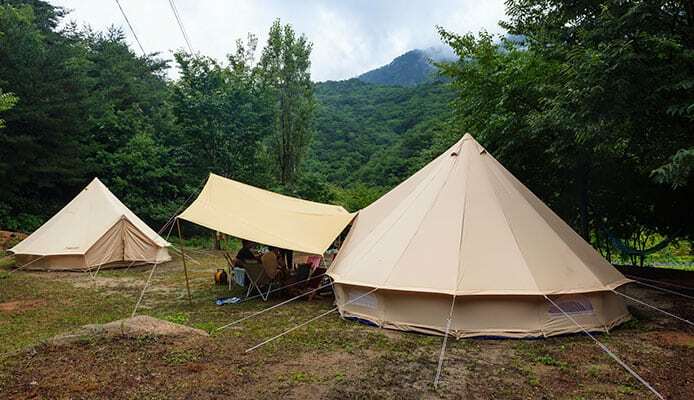 A polyester and polyurethane teepee tent may give it a more utility style look, whereas a cotton canvas teepee tent may resemble what you traditionally think a teepee should look like. Some teepee tents will have a center pole for structural support and others won’t. This can be obstructive when using your teepee tent and you may prefer to have a design where all the support stems from the outer edges. It is entirely up to you which style you would like to use or prefer. Q: What is a teepee tent? A: A teepee tent is a style of camping tent. 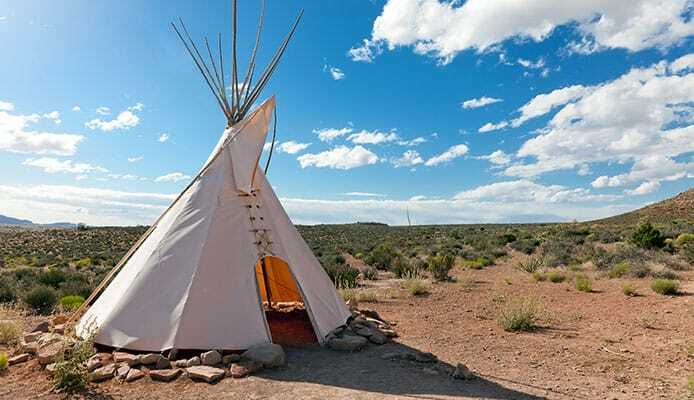 The teepee is most commonly recognized from the traditional use by Native Americans. The Native Americans constructed their teepee tents out of animal hides and it gave them the ability of having a portable home. When tribes needed to move with their food source, the teepee tent could easily be constructed, deconstructed, and carried to new locations. Teepee tents now are popular for use in camping and backpacking. They have been redesigned with modern materials and made portable for many different adventures. Q: What are the advantages of a teepee tent? A: Teepee tents are a unique style that many campers are beginning to use on their outdoor adventures. The biggest advantages of the teepee tents are that they have a compact design, which still delivers plenty of living space. Many teepee tents can easily sleep up to 10 people or even more. With the triangle shaped top, teepee tents give you the standing space that traditional tent designs lack. You will feel less claustrophobic with a teepee tent because they are so excellent at expanding their inside space. Teepee tents are great for larger parties because they can easily fit multiple people, while still leaving space for your gear to be protected as well. Q: Are teepee tents safe? A: Yes. Teepee tents are a safe option for use during camping and backpacking. However, as with any tent, you should take into consideration where you are going and what elements you may face. Most teepee tents can withstand up to 35 miles per hour of wind but could be at danger of collapse in windier conditions. As with any tent design, it is important that you know the details of your teepee tent and the elements which it is built to withstand. Many companies will provide safety guidelines in which they determine their teepee tent can be used safely. It is also important that you know how to set up your teepee tent to ensure you have stabilized the structure correctly. As long as you use the teepee tent within its safety guidelines and have secured the teepee tent well, using stakes and guylines, it is safe to use. If you ever question the safety of a situation in which you are using your teepee tent, always refer back to the manufacturer’s provided information. No matter which teepee tent design you choose, finding the best teepee tent is important. With many different designs and sizes available, it should be easy to choose what best suits your needs. The best teepee tents for camping will ensure that both you, your friends, and your gear will stay dry and protected. If you know exactly what you need, you can save time and money by investing in a top rated teepee tent for camping. Before you know it, you’ll be off having grand outdoor adventure. Do you own one of the teepee tents that made it onto our list? Let us know how it has worked for your outdoor needs in the comments section below.